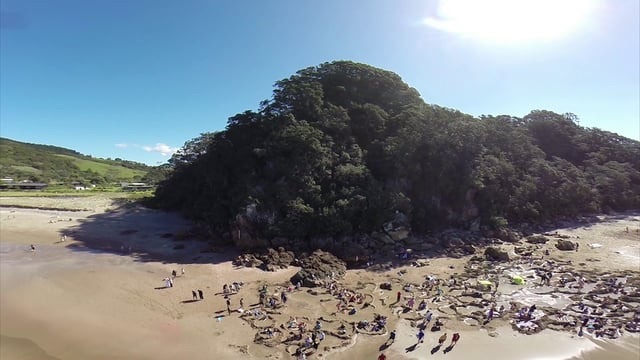 Hot Water Beach, on the stunningly beautiful Coromandel Peninsula in New Zealand, is an odd little place. The small settlement, which only has around 100 permanent residents, lies clustered around a golden beach and at first glance seems just like many other New Zealand coastal towns; sleepy in the winter with an influx of visitors and summer residents during the holiday periods. However, in this little township, regardless of the time of year, a wave of incomers, dressed in beachwear and brandishing shovels, comes crashing onto its shores every twelve hours. The reason for this lies in the volcanic and seismic nature of New Zealand due to its position on the Pacific Ring of Fire. Below the glistening sand at Hot Water Beach, an underground river of hot water flows from deep inside the earth, filtering through fissures and surfacing where the beach meets the Pacific Ocean. For two hours either side of each low tide, just enough of the beach above this geothermal well is exposed to make it possible to dig into the sand and allow water, which can be as hot as 64°C, to bubble through to the surface and form a natural spa pool. This twice-daily event attracts crowds all year round, numbering well into the hundreds during holiday periods and summer weekends, and totalling over 100 000 each year. It is a truly international affair with countless nations represented amongst the diggers, bathers and numerous curious onlookers. People with no prior connection to each other, and often with no common language, find themselves thrown together in the task of shoring up sandy pools against the sea and then sharing the spoils in a communal hot tub of their own making. The whole process provides a fascinating insight into many aspects of human nature, with displays of co-operation, collaboration, problem-solving, consideration and sharing, as well as occasional territoriality, exclusion and self interest. Whilst participating in some Hot Water Beach pool construction last weekend, a friend suggested to me that, as with building fires, there is something primitive about digging holes. There is a deep satisfaction in the basic securing of an area and protecting it against the elements which perhaps harks back to humankind’s earliest existence. Equally, Hot Water Beach is a reminder to us of how insignificant and puny we are in the face of the forces of nature, with our pools of warmth at the mercy of the elements, providing their comfort for merely a couple of hours before being reclaimed by the ocean. Perhaps it is because of these primordial associations or simply due to the pleasure of human interaction and collaboration, that, even considering the strangeness of sitting in a pool of muddy water with complete strangers as it is slowly destroyed by the tide, a visit to Hot Water Beach is an oddly satisfying experience.